Our professionalism towards Fireworks means that we work closely with you our client throughout the entire showcase, from the initial contact to the final discharge. This ensures that your needs and budget are met for a hassle free experience. We have a team of trained staff on site at all times and in charge of all our shows is Head Technician Brian Nosworthy. We cover many various types of locations such as large and small parkland, ovals through to close proximity and on water. We cater for all occasions, such as Government, Private, Corporate events, Festivity’s, Fairs, Functions, Birthday Party’s and Weddings. We’ve been contracted for various local councils, sporting events and the defence force. All Fireworks are individually selected and sourced from only the leading suppliers in Australia and Overseas by our show designer, this ensures that our client is getting the best and most up to date fireworks available. Wedding firework displays can start from $1,000. Call us today to discuss a quote further! Please contact us for a no obligation quote and assessment of your Pyrotechnic and Fireworks needs. 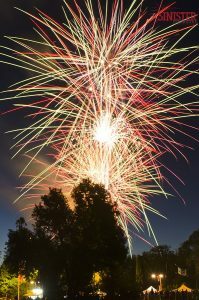 Although Sinister Fireworks is a relatively new business, Director Brian Nosworthy has been working within the fireworks industry for over ten years. Brian has worked with some of the Largest Firework company’s in Australia and on some of the Grandest Display’s.